Air compressors are an incredibly useful piece of equipment that will not only inflate tires but will help complete all kinds of jobs. One of the most useful functions of an air compressor is that it can power a range of tools much more economically than electric power tools. There are a lot of different air compressors which come in different shapes and sizes while dramatically differing in price. This can make it difficult to decide which to buy, and a lot of it comes down to what you will be using it for. 60-gallon air compressors are powerful enough to handle big jobs and are equipped to be able to run for a long time. Some of them are specifically designed for industrial jobs, and some are better for home DIY uses. View the Best 60 Gallon Air Compressor, Below. How to Install a 60 Gallon Air Compressor? How to Move a 60 Gallon Air Compressor? How to Fix 60 Gallon Air Compressor? Enough capacity to complete large jobs. With this product guide, you will be able to make an informed decision by comparing the relevant features of all the best 60-gallon air compressors. 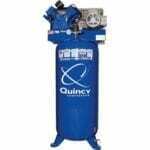 The gas-powered Quincy QT-54 Splash Lubricated Reciprocating Air Compressor comes with an industrial-duty US-made Baldor motor for durability. The air compressor has a 145-175 working PSI and a 1310 pump RPM. The capacitor start motor is made with a built-in thermal overload to avoid overheating and stay cooler because of their slower RPM. The oil carry-over (blow-by) rating is less than 5 PPM. These air compressors are built to last, to be efficient and to reduce operating costs to produce more compressed air at a lower horsepower. The Quincy QT-54 is capable of working to a 50,000-hour pump life rating. The finned tube intercooler creates a maximum cooling and improves the valve life. The flywheel is made from balanced cast iron for energy efficiency and durability with an aluminum head for improved distribution of heat. There is an extra-capacity oil reservoir for low oil temperatures, and the air compressor is splash lubricated. It features UL & CSA approval on all electrical components, and the company recommends a 50 Amp circuit breaker along with properly sized wire for best performance. This Quincy air compressor is designed for the most efficient experience with the least cost to provide you with the best results possible. The Ingersoll Rand 2340L5 two-stage air compressor combines quality performance with the reliability to withstand frequent use. The electrically driven two-stage air compressor is designed to last a lifetime in an industrial environment, with precision engineered components for minimal maintenance. It has a maximum PSI of up to 175 operating pressure which is perfect for highly demanding use. The product is a 5-horsepower air compressor which is designed to meet the requirements of industrial use in areas such as fleet maintenance, manufacturing lines, wood working shops, dry cleaners, car washes, repair shops, and farms. The industrial grade ODP motor is capable of working at 100% continuous duty. The All Season Select synthetic lubricant ensures its steady and reliable performance. The radical fins cool cylinders at 360 degrees to avoid hot spots, and the integral flywheel and high-energy copper cooler makes the compressor run at a cool temperature. The overhung crankshaft is designed for precision and is balanced for a smooth and quiet operation. This two-stage air compressor has a strong cast iron construction and is built for withstanding hard-wearing, heavy duty environments. The Puma Industries Pk-6060V single stage is a professional and commercial belt drive series compressor that features an oil lubricated, single cast iron pump. These are much more durable than aluminum pumps to ensure a longer life, and the splash lubrication ensures smooth and quiet performance. The portable units feature a built-in pressure regulator and a quick coupler to control the pressure of outlet air. The single-phase induction motors have overload protection to avoid damages, and the steel wheels use ball bearings to avoid flat tires and increased mobility. It comes with a 3 HP running time and a maximum PSI of 135. This air compressor is great value while delivering an easy and quiet performance, made for professional use. This DeWal two-stage air compressor is made for industrial use and offers high power with a maximum PSI of 175. This gives enough power to operate multiple air tools and devices for increased productivity. The consistently efficient pump and piston design is patented and provides a cooler running pump with its deep groove directional, asymmetrical cooling fins and cast-iron flywheel that has largely extended fins. The industrial level air intake filter is durable and strong, with an easily accessible oil level sight glass and oil drain to conveniently keep track of. It has a 4” extension, a low pump RPM and a 5.0 HP electric motor with thermal overload protection to ensure the motor is safe against voltage fluctuations. A magnetic starter is not required for added convenience. The air compressor includes a large ¾'' air outlet port and is equipped with a tank pressure gauge and a wire form belt guard for improved compressor cooling. This patented DeWalt two-stage air compressor is efficient and reliable, perfect for the use of multiple air tools such as impacts, ratchets, sanders and cutting tools. The Industrial Air 60 Gallon single stage air compressor is made to withstand a long run time for air tools. The air compressor has a 155 maximum PSI and delivers 11.5 CFM at 90 PSI with a 3.7 HP motor and 240-volt operation. The cast-iron ASME tank provides durability and allows the compressor to run for longer and stay cooler. The twin-cylinder is also cast-iron with an oil-lubricated pump for a smooth and quiet operation. It is UL and CSA certified and includes synthetic oil for efficiency. These air compressors are designed for heavy duty needs of industrial environments of mechanic shops, livestock operation, and service trucks. All components are strong and durable and are built to last under the toughest and most demanding conditions. The cast-iron cylinder body and aluminum head and valve plate are made for durability. The easy to read oil sight glass and easily accessible oil cap make refilling the compressor simple and efficient. The Industrial Air single stage air compressor is lighter than most air compressors and features a sleek design and is made with components that are built to last. The PowerMate single stage air compressor is ideal for DIY at home as well as professional users. The one-piece cast iron crankcase is built to last, with a thermally stable cast iron cylinder body that is durable and efficient. It features an aluminum head and valve plate with 155 maximum PSI pressure for the highest-level tool performance, and the air receiver provides more air for longer run times on air tools. The spread voltage motor allows the compressor to operate on 208 or 240-volts without wiring changes. The compressor is shipped with synthetic oil for the best performance and longest life and is equipped with a pressure gauge and on/off switch for the best control. The cast iron twin cylinder pump, oil level sight glass and easily accessible oil fill contribute to a design that is able to withstand heavy use. The PowerMate single stage air compressor is great for those who would like to use it for both DIY at home and industrial usage. The Industrial Ail IV5076055 two stage air compressor offers an industrial performance of a maximum PSI of 175, providing enough power to use multiple air tools. The low pump RPM makes for a longer life to get the best usage from it. The electric motor has thermal overload protection to avoid overheating, and the air receiver is an industrial-sized capacity. The wire form belt guard improves compressor cooling for efficiency and transporting is easy with the four tie-down holes in the platform base. The patented pump and piston design also contribute to the efficiency, along with the cast iron flywheel and large, extended fins. The Industrial Air two stage air compressor is similar in features to the single stage version apart from being more powerful. Its two-stage air compression allows for double the pressure making it highly efficient and produces faster and easier results for manufacturing use. This air compressor is one of a wide range made by Industrial Air, and this two stages version is an even more powerful version of their machines. The Maxair C5160V1-Map stationary compressor is built with rugged cast iron cylinders for endurance and longevity. The ‘V’ design reduces vibration while in use and increases cooling time, extends the life of the air compressor and the ability to remove the cylinders makes for simple maintenance. This single stage high-performance cast-iron air compressor has heavy duty mechanisms including a pressure switch and a durable metal belt guard. The oil drain is fitted with convenience in mind, and the extended drain base is located at the front of the unit for easy use. The oil gauge can be seen and refilled easily. The air compressor also has an outlet power regulator with quick connectors so you can stay in control while under operation. This single stage air compressor is built with control and convenience in mind to offer you an easy operating experience. This single stage three-cylinder air compressor is made from high-quality materials with a cast iron cylinder body, and a 12" one-piece cast iron crankcase. The 240V heavy-duty induction motor guarantees power and the splash type lubrication offers the best results. It is equipped with a pressure gauge and an on/off switch for easy controls. This air compressor has a high airflow with an aluminum head and valve plate for enhanced cooling and faster heat dissipation. The 4.7 HP motor is able to drive high pump performance for stress-free use. This industrial Hi-Flo air compressor can handle large jobs with ease while operating multiple air tools. This vertical, stationary air compressor is ideal for producing long-lasting compressed air solutions to consumption air tools such as nail guns, paint sprayers, sanders and more. Made with a combination of sturdy materials for power, and light ones for optimum cooling, this air compressor produces fast and easy results for industrial use. This VT6314 stationary air compressor has a powerful 3.7 HP motor with the ability to provide air to multiple power tools. With a maximum pressure of 135 PSI, the Husky air compressor has a traditional and sleek design that offers a quiet performance. The twin cylinder pump delivers 1070 RPM with a protective belt guard to enhance your safety. The tank is made from durable steel, and the high-quality gauges are extra-large and easy to read making it simple to control the pressure being delivered to your devices. The air compressor comes with a changeable automotive-style air filter for best results and is over 35% quieter and 60 degrees cooler than aluminum pumps with cast iron sleeves. It is ideal to use with airbrushing, blow cleaning, bolting, nailing, stapling, sanding and surface prep to name a few. The Husky 60-gallon electric air compressor is made with extreme durability and a space-saving vertical design that is perfect for your home, garage or workshop. Before you buy a 60-gallon air compressor, it is worth considering what you will be using it for. All air compressors vary in functions, and some are better than others for specific uses. Once you know what you will be using it for, the specifications of the air compressors will be easier to compare. For example, the air volume and pressure required will vary from tool to tool. For the best performance, make sure you get an air compressor that is powerful enough for your largest tools. Some air compressors are able to power multiple tools at the same time which is only useful if you know this will be needed. There is no point spending money on extra features you know you won’t need. Some air compressors are exclusively built for home use and DIY, while others are built for industrial shops or a combination of both. If you are only using your air compressor at home, you may not need one that is as powerful as these are usually more expensive as they are designed to be used more frequently. Single stage air compressors are better equipped for smaller jobs such as nailing, sawing, and other DIY tools. This is because the air is only compressed once, which means that the pressure is lower than two-stage air compressors. While they are less powerful, they are designed to be powerful enough for these smaller jobs, so you don’t need to worry about them not being good enough to be used for tools around the garage or house. Two-stage air compressors offer twice the pressure because the air is sent through another cylinder that compresses the air again as well as cooling it. This generates a higher level of PSI which makes the air compressor more capable of generating enough pressure for industrial use and for automotive purposes. For smaller capacities, consider 20-gallon or 30 gallon air compressors. 60-gallon air compressors are powered either by electricity or gas. This is something worth considering when choosing an air compressor as this will affect the cost and portability. Electric air compressors are cheaper to run, and you don’t have to worry about refilling them. This makes them especially more convenient if it will be running for long periods of time and there is no possibility of spillages or leaks. Electric air compressors are generally more efficient than gas-powered versions, although they are less portable which is something to consider if you will need to move it around often. You may be more suited to a light air compressor that you can carry from place to place. The level of PSI will depend on what kind of work you will be doing. 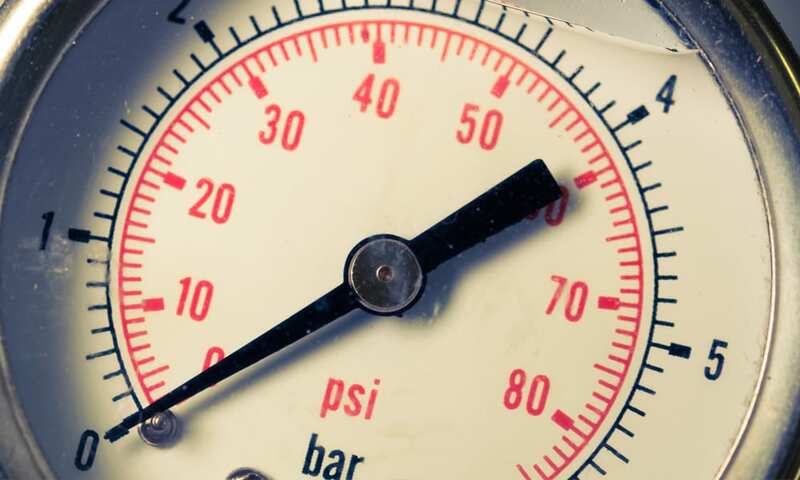 If you need the air compressor for industrial purposes, it will need a higher maximum PSI than one which is only going to be used for smaller jobs. A lower PSI will suit powering woodworking tools and inflating car tires. If you will be using multiple tools at once, or lots of pneumatic tools then it will be worth looking for a higher PSI capability level. It is worth noting that two-stage air compressors will deliver a much higher PSI level when comparing models. Once you have decided where you would like to place your air compressor and hose length to easily reach your work area, you will need to set the compressor on isolator pads for stability and to minimize noise from vibrations. If necessary, you can screw in the air filter to the side of the compressor to ensure clean air is being dispensed. If it is electrically powered, you will need to select a power outlet to attach the air compressor to before activating any tools you decide to use. Connect the air hose before use. It is always better to use hose extensions rather than power extensions to get the reach you require to avoid voltage dropouts. Then you can plug in any tools you need to use. Remember to check the oil levels before use. Once turned on, the tank will fill with air automatically to its maximum and then will switch off until you start using the supply. It will then refill when needed. If you are transporting a new, unused air compressor home for the first time, you will be able to lay it down. This should be avoided after it has been used as it can cause maintenance problems. If it has been used it is better to be moved in the upright position. First, you should check your air compressor is under warranty or not. You will then need to diagnose the problem. One of the more common problems that need fixing is the pressure switch. Always use proper tools and safety equipment and follow the instructions created by the company. Air compressors significantly vary in weight. When transporting the air compressor and if you think you will need to move it regularly, it is best to choose a lighter one as they cannot be laid down once used as this will cause damage to the device. Make sure you select the right hose for your air compressor. You don’t want to use an industrial length hose with a smaller air compressor if you are only using it for small jobs. We hope you enjoyed our article on "10 Best 60 Gallon Air Compressors in 2019", if so, please share and rate it.